Our group works down along the Southern bank of Kedron Brook, from about Skyring Street, Mitchelton, around the Mitchelton Pony Club, and finishing just upsteam of the adjoining Osborne Road Bushcare site opposite Teralba Park. See our location on the UBD Map 138 ref. L1. Our area is an important link in the Mountains to Mangroves Corridor, particularly because of the forest remnant distributed mainly along the Northern bank of the Brook at this site. The results of successive plantings on the southern side has vastly improved the forest habitat. 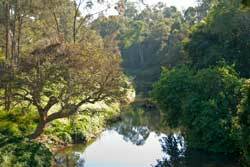 The group's area directly adjoins the Osborne Road Bushcare Group area downstream and together they provide a significant pathway and habitat for a wide range of wildlife. However, directly on the sloping banks, bird dispersed weed species had overwhelmed the area in past years. Thus, Madiera, Morning Glory and Glycine vines were suffocating trees and shrubs, especially on the South-Western banks. Over the past three years, a vigourous fight by our relatively small bushcare group has made great inroads into the reclaimation of the area for the natural flora and fauna. The support from volunteers from adjacent bushcare groups has played an important part in this endeavour. 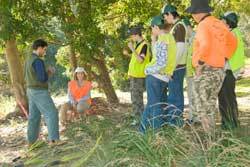 Volunteers from Volunteering Australia with Bushcare Leader, Helen Moriarty. In early 2008, our Bushcare Group received a Community Assistance Scheme grant to support its bid to enhance the bushcare habitat . Personally supported by Councillor Vines, the grant money was allocated under the environmental category of the Council’s Community Assistance Scheme in 2007. This timely support enabled us to clear a large section of weeds along the banks of the Kedron Brook and to re-establish a buffer of native vegetation. In 2008, an additional grant from Brisbane City Council and another massive effort was carried out through the winter and spring seasons for this year. The Glycine, Morning Glory and Madiera vines infestation has been particularly difficult to remove. But with steady work by our local volunteers, this patch will soon be completely removed. We expect to have to follow-up at periodic intervals with chemical until we can finally claim to have beaten this weed. An Art and Sculpture Project was also completed along the Brook at Mitchelton in 2008. Helen Moriarty and Janet White of the Osborne Road Habitat Brisbane Group were responsible for coordinating the project on behalf of KBCB and worked closely with BCC, Mitchelton Pony Club and other local groups and residents. All of the three components of the project have been completed. Locals were invited to help sculpt the sandstone sculptures, many of the volunteers discovering a talent they never knew they had under the guidance of professional sculpture artist Paul Stumkat. The artwork was unveiled on Saturday 2nd March 2008. The day was attended by over 60 people and proudly supported by Cr. Maureen Hayes. If you have not yet seen these wonderful sculptures it is well worth the time. The sculptures can be seen from McConaghy Street, Mitchelton through to Osborne Road. The construction of the bikepath took place during January 2008 though the vital bridgework across the Brook near Osborne Road to the Mitchelton Pony Club grounds was delayed until the end of June 2008. In addition to the weed management program, we have contributed to the Stream Snapshot observations conducted by KBCB - WPSQ each year and take part in the frog and bird observation activities conducted in the area. Our Group would welcome any interested people along to our monthly weeding and revegetation activities. 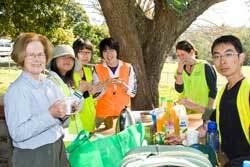 We normally meet every Tuesday morning on the southern bank of Kedron Brook, opposite Teralba Park, just upstream of the Osborne Road Bushcare Site.